This is an indie point and click adventure game, created in a top down, 2D perspective with RPG Maker. The gameplay harkens back to the adventure games of old, with lots of text descriptions, puzzle solving and item usage. 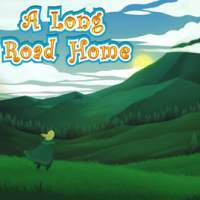 It puts players in the role of a young man (with any name of your choice) who becomes wounded and separated from his family when they are attacked along the way to their new home. Behind this plot is a secret cult led by an alien being called Amuna, who is able to travel between the infinite numbers of planes (dimensions). Having conquered numerous worlds already, she now has her sights set on this one, and aims to use our hero for her own devious ends. If the protagonist is to reunite with his mother and sister, he must venture through catacombs, secret temples and frozen mountains while escaping the clutches of the evil invaders.